I found five wheelbarrows over these last three days. Five! That’s ridiculous. And it’s one thing to see old wheelbarrows by the side of the road and another to put them in the back of your van, take them home and then proceed to obsess over them. But I can’t help myself. Maybe I am carting about a heavy load and maybe these barrows are meant to be a help? Either way and evidently enough, I am quite obsessed. It feels like someone is putting them directly into my path. That’d be right. Just like me to conjure a conspiracy plot or concoct some deeper meaning. But what’s it all about. What do all these wheelbarrows mean? Usually they’re useful as a device for carrying loads and are typically found on construction sites and in gardens. Designed to distribute the weight of the load between the wheel and the operator, the wheelbarrow enables the convenient carriage of heavier and bulkier loads than would be possible were the weight carried entirely by the operator. Thank you, Wikipedia, but that was not the kind of meaning I was after. I guess you can’t Google everything. What am I going to with them all? I could give them away as Christmas presents, some of them are rather pretty. I could plant them up. 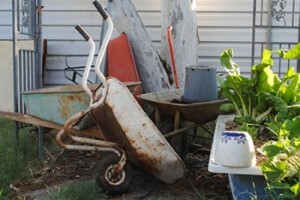 One suggestion was a wheelbarrow fixing workshop, sell them or install them as art. I realized I was actually quite attached to them when I gave one to my housemate. That was in the early stages of these happenings. I had only found two by then. I thought, one each, that’s fair, but now I kind of wish I hadn’t. It was one of the prettiest ones … but no, it’s OK, her flowers will be very happy in there. And yes, I gave one to the community garden. But I can’t shake the sense that something is trying to tell me something. Grow something? I’m already growing stuff. But OK, yes, I will go get some seedlings and plant out one or two of my new treasures. Leaving just one for deft maneuverings, swift reachings of great heights along narrow planks, weaving around obstacles and getting in and out of tricky predicaments with ease. Build something? Have you heard the tale of the tightrope walker and the wheelbarrow? Well, he had a spectator who was hugely supportive of his balancing acts. Right up until the act that required the spectator’s participation. “Good, so now get in,” the balancing man said to his all of a sudden silent fan. So a tale about trust, conviction and courage. A tale warning against overlooking the obvious.